You notice a few spots of rust here and there, and naturally, you don't think it's anything too serious. This, however, can be a mistake as rust impact other garage components when it spreads. It generally starts to appear because of moisture and is unlikely to go away on its own. For these reasons, it's best to take action early when you notice the beginnings of rust in your system. The first step in the process of handling rust is to prevent it from spreading. Thicker layers of rust can be removed with the use of steel wool. The thicker and stronger the wool, the better the result usually is. Even with the best tools, it's worth bearing in mind that scrubbing rust from garage door components can be quite labor-intensive. When most of the rust has been removed, the appropriate solvent should be applied - this should help to leave the affected surface perfectly clean. It is possible for metal parts to start corroding. In this case, the corrosion should be abrasively removed before it spreads. In some cases, it is more cost-effective to simply replace the part. For example, if your existing rollers are severely damaged, you can have them replaced with new nylon ones. These are not only fully resistant to corrosion, but also quiet and maintenance-free. 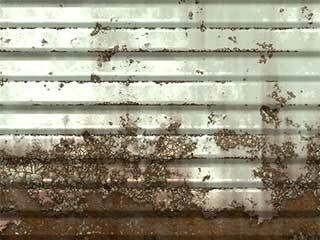 In order to prevent rust problems in the future, you should identify the source of moisture and eliminate it. Typically, moisture occurs due to condensation. The best way to stop this process is to install sufficiently thick and strong bottom seals as well as on the sides and top. Keep in mind though that these parts are subject to wear and tear and may have to be replaced with new ones eventually. The other major protective measure is to painting and re-paint the external facing panels. You must apply paint specially made for exterior use and which provides protection from moisture and the ultraviolet radiation of the sun. Annual repainting is also recommended.